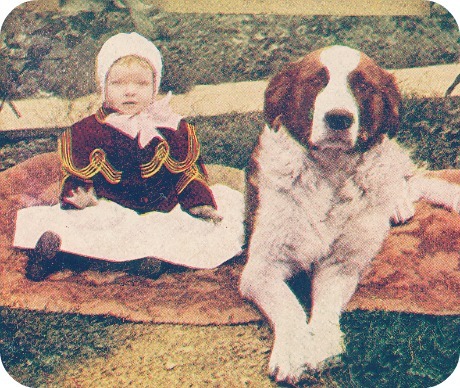 Babies and dogs have been growing up together for centuries, and literature and Disney have done their part to idealize the relationship as natural and magical. In real life, though, it usually takes some forethought and some work to nurture that mutual enjoyment. Young children and infants can’t make informed decisions about how to interact with dogs, generally or individually. So if I may be so bold as to boil down the plentiful good advice out there on dog-child safety, it’s that educated adult supervision is required every instant that a dog and kid are sharing space. Schedule a vet check. You won’t want to realize that your dog is due for his annual shortly after bringing a new baby home. And your veterinarian can look for any medical conditions that might affect your dog’s behavior or interactions with children, from anxiety to joint pain. Train your dog. Good manners should be in place, and fluent in the face of various distractions, before the baby arrives. Helpful behaviors include extended sits and downs, settling on a mat, leave it, drop it, going into a crate or confinement area on cue, and loose leash walking (next to a stroller, if that’s in the plans). Bone up on canine communication. Recognizing the earliest signs of canine stress is key to heading off aggressive behavior. Dogggone Safe has great visual resources for learning about these signals. Establish safety zones for baby and dog. Each of these creatures should have at least one place—in the house and also in the car—that is off limits to the other. Set up physical barriers to delineate these areas clearly. If these limits are new to your dog, start creating positive associations with them and gradually adding distractions as early as possible. Introduce baby sounds and activities. There are commercial recordings of babies and children intended for this purpose. Play these sounds, at a low level at first, and watch your dog’s response for any signs of agitation. Feed your dog for settling on a mat or bed or otherwise behaving in a relaxed manner while listening. Gradually increase the volume level as your dog gets used to the sounds. Do the same with actions you will be performing with the baby (using a doll swaddled in a blanket) as well as with any accessories that move and make noise. Stock up on safe, long-lasting chews and Kongs. One Kong that you have to constantly wash out and re-stuff is not going to be enough—make a bucketful to keep in the freezer. Keep baby’s face away from the pointy end of the dog. On coming home, hold the baby so that when the dog investigates, it’s the feet he has access to and not the face. If necessary, use the dog’s pretrained safety zone to set up appropriate distance, and feed the dog treats while adults tend to the baby nearby. Even after introductions have been made, the dog should not be encouraged to lick the baby or sniff the baby’s face, and the baby should not be encouraged to kiss the dog. Feed dog and the baby separately. Here’s a great tip from my mentor and colleague Laura Monaco Torelli at Animal Behavior Training Concepts: Don’t allow children to interfere with dogs during meals, or vice versa. Babies and toddlers tend to drop food, which can encourage lingering near and under the high chair. A dog can easily learn that nudging, jumping up on, or nipping at the child produces more food on the floor. Manage the dog away from areas where the baby is fed using tethers, exercise pens, or baby gates. Make those areas just as appealing as the high chair using the dog’s own food and treats. Reinforce relaxed indifference. The dog shouldn’t pay close attention to the baby’s every move—and the baby shouldn’t pay too much attention to the dog either. Use the safety zones you’ve set up, and when baby and dog are sharing space, reinforce parallel play and rest. Hopefully you’ve practiced this ahead of time with your doll or swaddled pillow, but be prepared to temporarily lower your expectations and up the dog’s paycheck for the real thing. Manage access to the dog as you would access to any other normal but potentially dangerous objects, like knives and matches. Please, please, please read more on this extremely sensible perspective in Madeline Clark Gabriel’s excellent blog series on not letting babies get “magnetized” to dogs. Seek professional dog help immediately if your dog seems uncomfortable or agitated during any of these preparations, or once the baby has arrived. Without question, it takes time and effort to prepare a dog for a baby, but it is time and energy well spent. Planning ahead and erring on the side of caution can help everyone live a long and happy life together. Kiki Yablon can be reached directly via Dog Training by Kiki Yablon. Photo Credit: Antique Dog Photos via Flickr / Creative Commons. As a dog "mom" looking to be a human mom in the coming year, this article is well timed - especially love the tips around the safe zones and feeding time! Interesting read. When I was pregnant with my first child, Sara I used a book called Tell Your Dog You're Pregnant: An essential guide for dog owners who are expecting a baby. It was really helpful and came with a baby sounds and toy noises. Max (my fur child!) took some time to get used to the sounds but the book helped on how to do it. It gave me advice on what changes will occur and how to prepare my Max for them. It also talked about the causes for aggression and why it might occur and how to avoid it. It is written by a vet behaviorist too so it cover health issues as well - I got it from www.babyandpet.com.au or Amazon too i guess - mayb that will help someone else! GREAT post Julia!! I will be sharing it with any friends and family that are adding to the family!! Thank you so much for these great tips! !